You use A565 on our outline "freeway net". Then use the exit No. 3 ("Bonn - Auerberg"). Now drive towards "Bonn-Zentrum", then on the second crossroad you turn left, then the first street right and then straight ahead. There you will see on the left side a petrol station "Aral". Drive on for about 200m straight ahead and you will see Hotel Am Römerhof on the left side of the street. You can turn to our parking area (house passage). Tram number 61 (towards "Auerberg") up to the stop "Rosental". Then walk back about 20m and you see the street "Rosental". Go straight using this street and for about 100m you will see straight ahead Hotel Am Römerhof - it is a few minutes walk. Alternatively, you can take either bus no. 600, 601 or 551 (towards "Graurheindorf/Troisdorf") up to the stop "An der Esche". 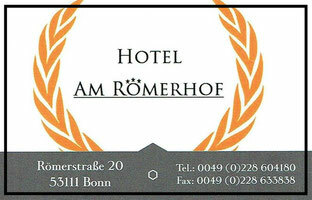 Then go back about 30m and you will see Hotel Am Römerhof on your left side. Another alternative would be you use the underground train 66 "Telekom Express" (towards "Siegburg") and alight at "Bertha von Suttner-Platz". Walk straight for about seven minutes along the street "Sandkaule - Welschnonnenstraße - Römerstraße". 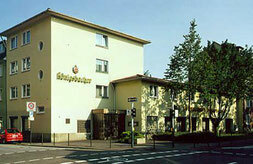 You will pass the "Beethoven Hall" and three minutes later on the right side Hotel Am Römerhof. From airport, take the airport bus number SB60 (to Bonn) and alight at "Beethovenhalle" in Bonn. Then go back for about 80m and you see Hotel Am Römerhof on the right side.